Here is why Rajinikanth-Akshay Kumar's 2.0 couldn't be next Baahubali 2? The makers of Rajinikanth and Akshay Kumar starrer film 2.0 have played a safe game while announcing the release date of their film as 27th April 2018. The April month counts as the holidays month and the benefit of holidays directly goes to the films that are released in the same months. We have an example of Prabhas starrer Baahubali 2 that created history at the box office. 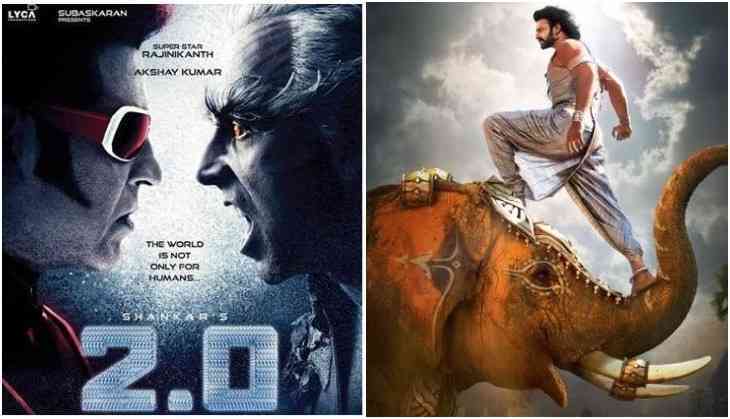 While looking at the same prospects, the makers of 2.0 have decided to release the film in the same week and on the same day. Now why we are saying that this film can't be the next Baahubali 2 is because there is a difference between Baahubali 2 and 2.0 releases. Well, Baahubali 2 was the most anticipated film of the Indian cinema and the audience, who watched the first one, wanted to know the secret mystery of this film. Now when it comes to 2.0, we don't have any big aspect regarding mystery or something. The interesting thing is that when Baahubali 2 released, the others films ran away from the nearby weeks of its release, even big films didn't release after two-three weeks of Baahubali 2. But 2.0 has a different story, according to some reports three big films from Hollywood and Bollywood are all set to release with 2.0. Hollywood's much-anticipated film and the third sequel of Avengers series, Avengers: Infinity War is also releasing on the same date 27th April 2018. Other two films are from Bollywood, Kangana Ranaut starrer Manikarnika - The Queen of Jhansi and Tiger Shroff starrer Baaghi 2 are also releasing on the same day. So looking at the scenario the audience will get divided into three parts, some people will surely love to watch Avengers: Infinity War and Bollywood audience can also be a divided in Baaghi 2, Manikarnika, and 2.0.